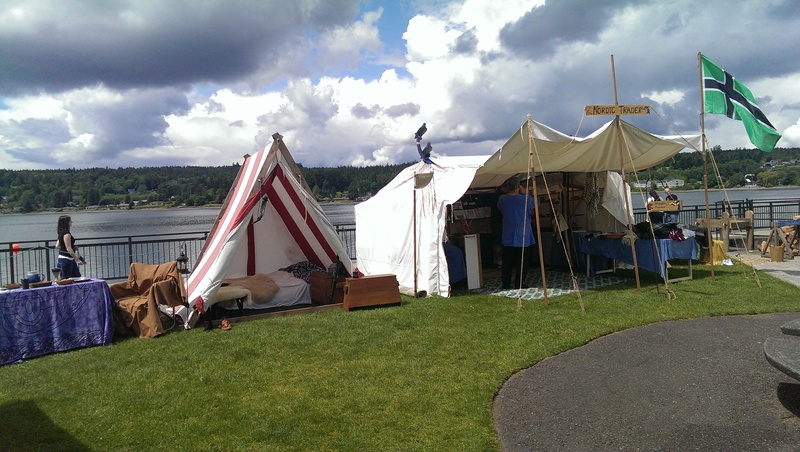 It’s that time of year when the Norse gods and goddesses gather in Poulsbo, Washington to celebrate Viking Fest. 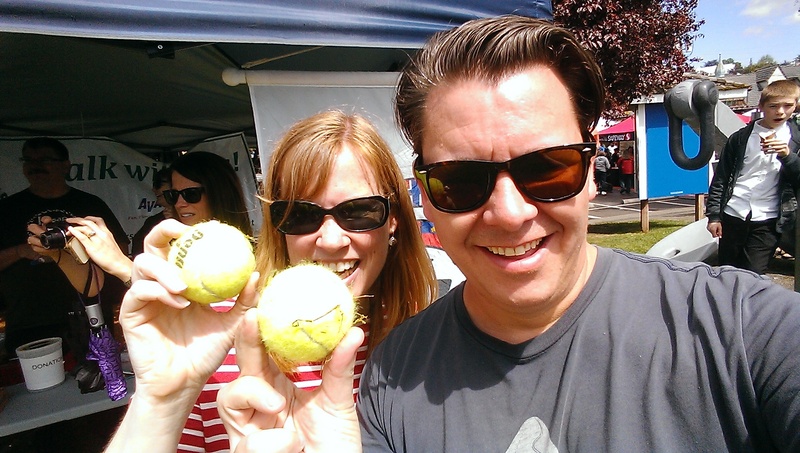 When Chad and I heard there was a festival called Viking Fest, we knew we had to check it out. 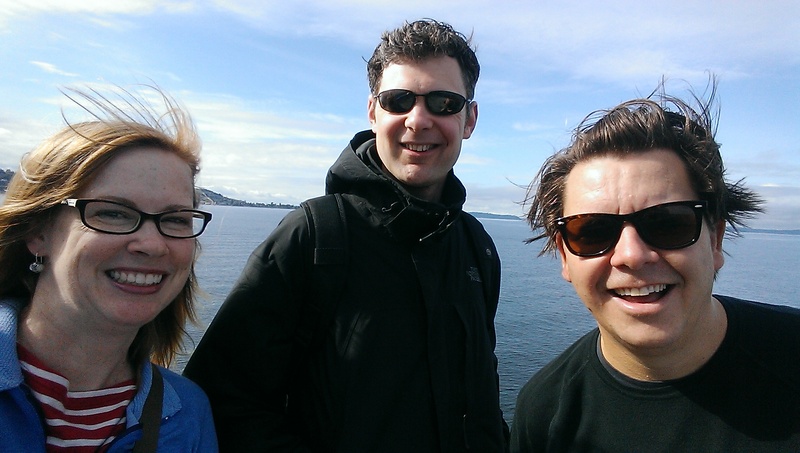 On our way to Viking Fest! 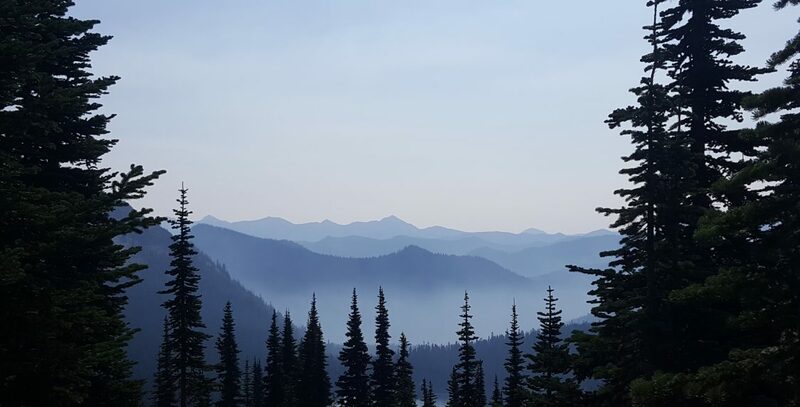 driving north and then west to the town of Poulsbo. 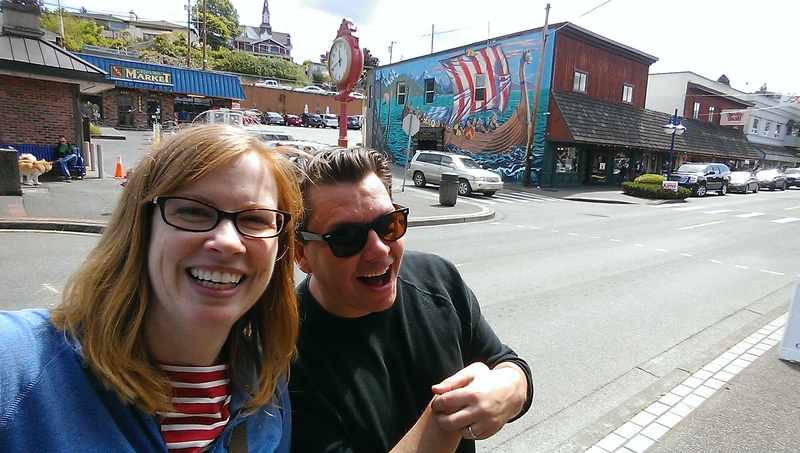 Poulsbo is a gem of the PacWest – a truly Scandinavian town nestled on the banks of Liberty Bay. 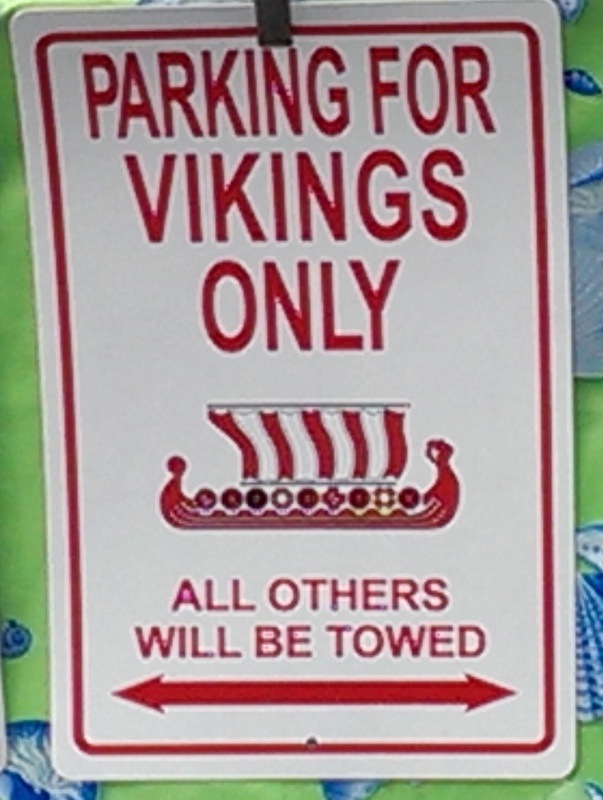 Viking Fest, according to the Poulsbo Chamber of Commerce, is designed to “celebrate Poulsbo’s Proud Norwegian Heritage.” Why not? Even though I’m of Danish descent, I figured…close enough, right? 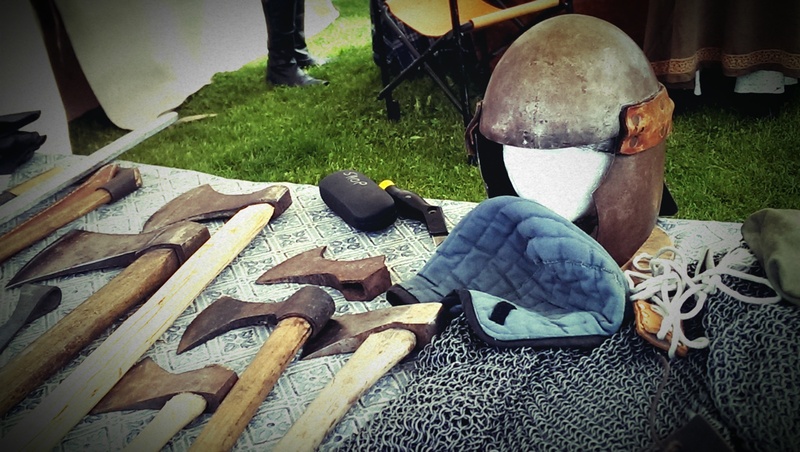 Viking Fest is a 3 day extravaganza Friday – Sunday. 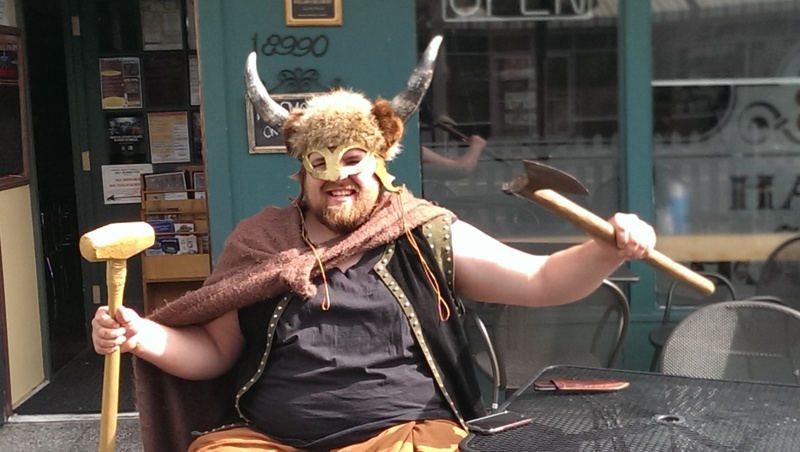 The year we first experienced Viking Fest, we arrived in town and the first person we saw was this awesome Viking, hanging out at the local pub. It turns out he was a character in the Viking Fest Murder Mystery, which was solved that day by one of the Viking Fest visitors. This Viking definitely won “best costume,” in my opinion. 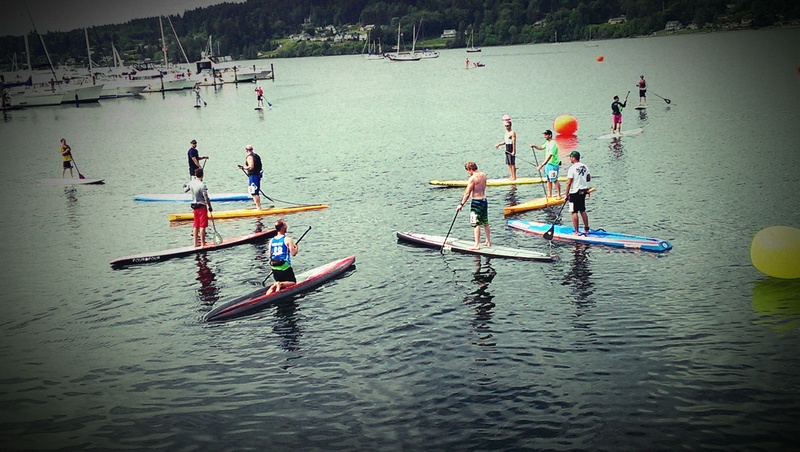 I was really hoping the contestant paddlers would be wearing Viking hats, but unfortunately no one got that memo. Still it was fun to cheer on the paddlers as they raced around the bay. 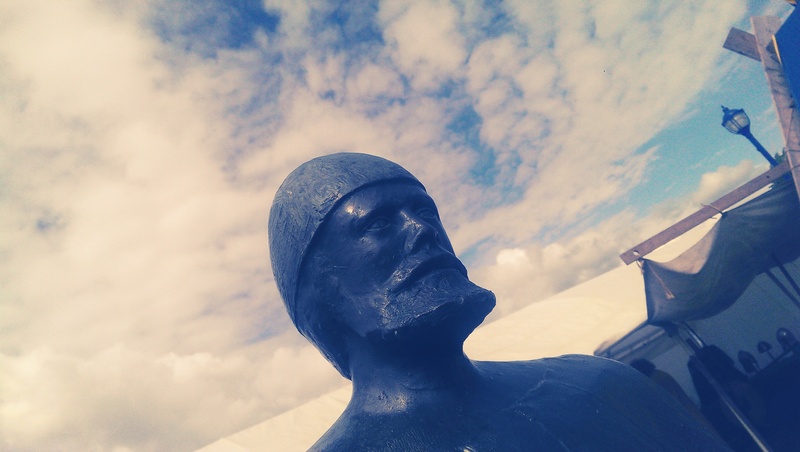 We then explored the Viking Village which was set up in the American Legion Waterfront Park. There were Viking tents, antique artifacts such as swords, pelts, gristmills (also known as “Norse Wheels”), and other items of everyday Viking life as it would have been in 1500 A.D.
At the Village, people in Viking costumes were on hand to explain the collections and they let us try grinding grain in the gristmill. There were food booths featuring local cuisines (most of which were not very Norwegian, but they satisfied the hungry crowd). 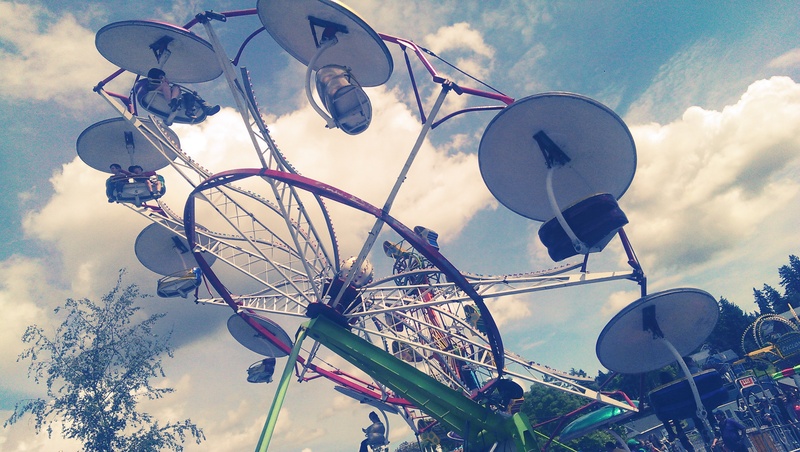 There was a nice carnival area with games and rides – complete with our favorite death-defying ride The Zipper. 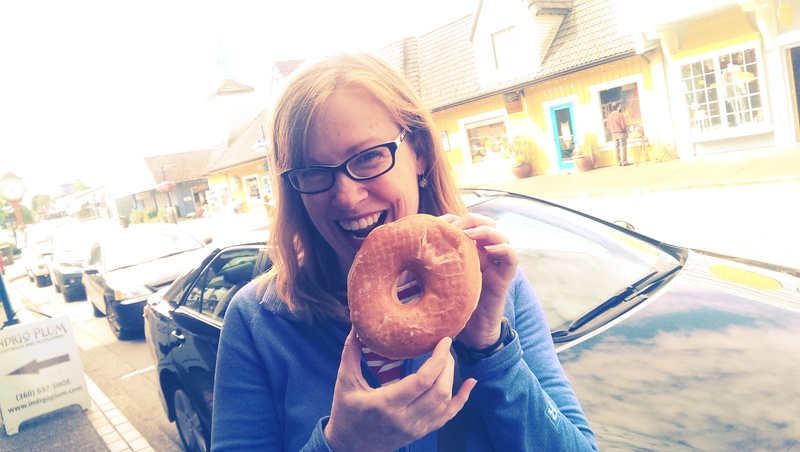 This Viking Donut is practically the size of my head! so we didn’t want to risk a ride on the Zipper, but we enjoyed watching others on the ride as they screamed and hollered in sheer glee/terror. 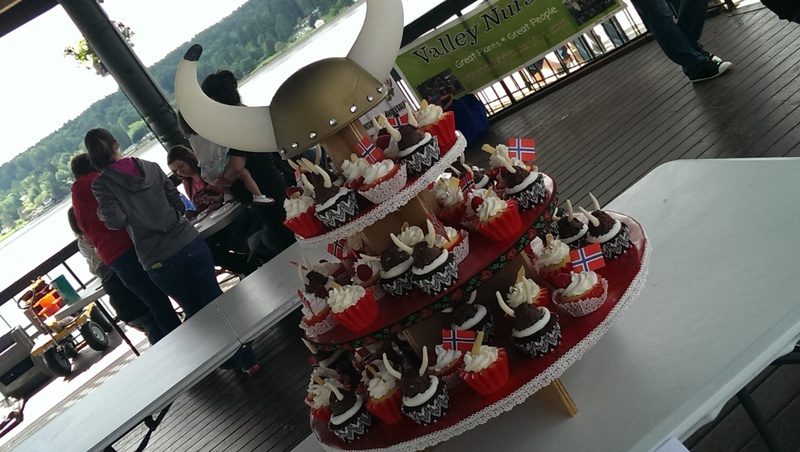 We returned to the American Legion Waterfront Park for more Viking fun – a Donut-Eating Contest sponsored by none other than Sluys’ Bakery. 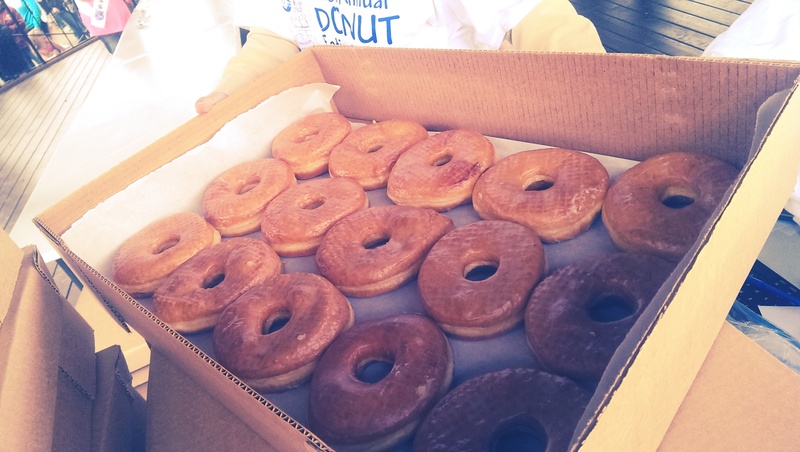 The crowds lined up to watch people of all ages try to consume as many donuts as possible in a 2-minute time frame. 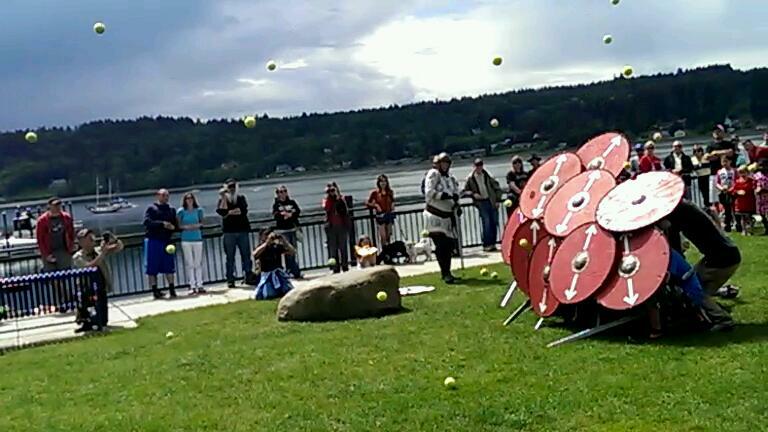 Actually, there were so many contestants, that Viking Fest held heats of different age ranges for this contest. 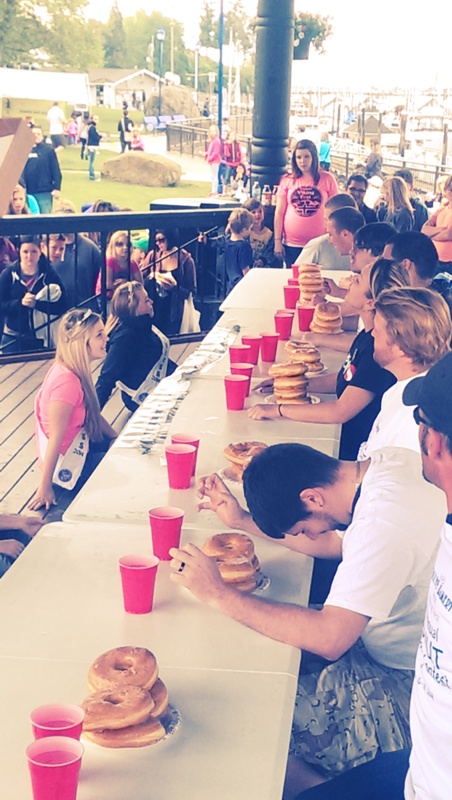 Having only witnessed food-eating contests on television, the live event was fascinating to watch. 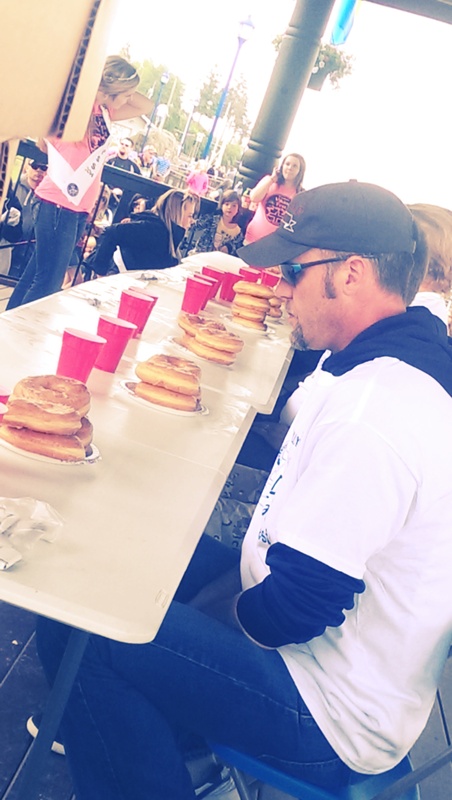 The Donut Eating Contest was followed by the Kupcake Krigen (Cupcake War). Many people (ourselves included) were hoping this meant a bunch of Vikings throwing cupcakes at each other in a massive food fight. Sadly, this was not the case. The “Cupcake War” was a cupcake decorating contest. The creations were lovely and afterwards, we were able to taste them (yum! ), but it paled in comparison to the thought of a cake flinging battle. Thankfully, a Viking from Viking Village saved the day by providing true Viking Wars. 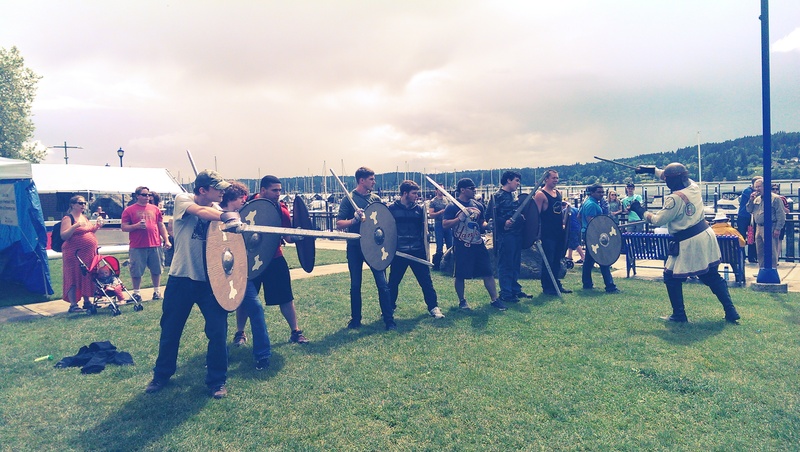 He had volunteers from the audience divvy into two teams and then he instructed them in the art of Viking Battle. The team leaders would yell “Advance” and, with Viking shields up and swords drawn, the team would approach the other team. Swordfighting ensued. The best part was when this Viking handed tennis balls to the audience who then pelted the soldiers as they tried to advance. After the Viking Wars, the Oyster Eating Contest took place. This was also a spectacle to observe with awe and a bit of nausea as people slurped down dozens of oysters in rapid time. The Oyster Eating Contest was followed by the Lutefisk Eating Contest. These Norwegians like to pound their food, apparently. Dates: This year Viking Fest is May 19, 20, and 21. 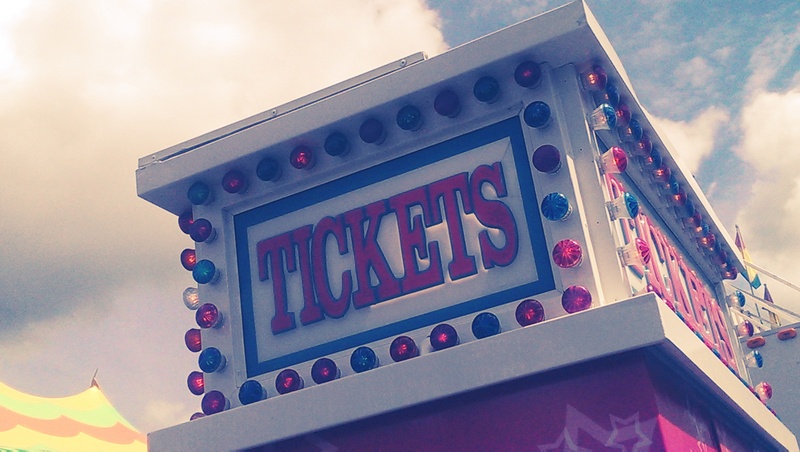 Typically the festival is held the third weekend in May.